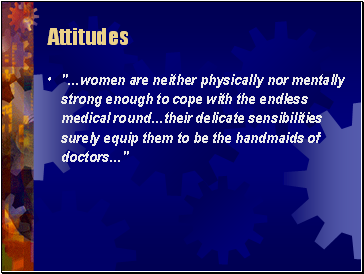 "…women are neither physically nor mentally strong enough to cope with the endless medical round…their delicate sensibilities surely equip them to be the handmaids of doctors…"
Back in the mid 19th century, middle class women were encouraged to live a domesticated life, persuaded that their ‘delicacies’ made them suitable only as helpers and ‘handmaids’ in a working environment. 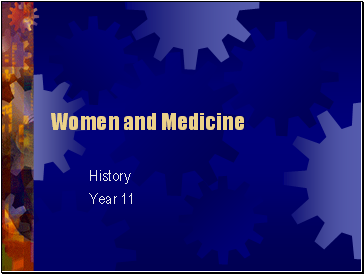 There were no opportunities to study and practise medicine and it took hard work and years of struggle to establish the position of women in medicine that we see today. 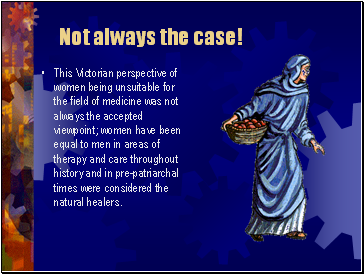 This Victorian perspective of women being unsuitable for the field of medicine was not always the accepted viewpoint; women have been equal to men in areas of therapy and care throughout history and in pre-patriarchal times were considered the natural healers. 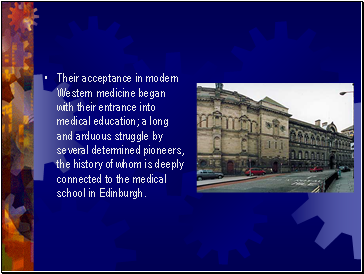 Their acceptance in modern Western medicine began with their entrance into medical education; a long and arduous struggle by several determined pioneers, the history of whom is deeply connected to the medical school in Edinburgh. It was at the University of Edinburgh that a bizarre story is set. 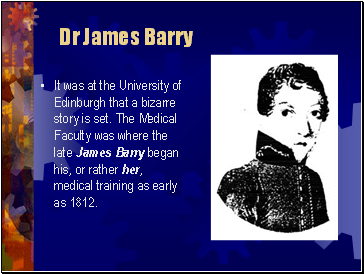 The Medical Faculty was where the late James Barry began his, or rather her, medical training as early as 1812. 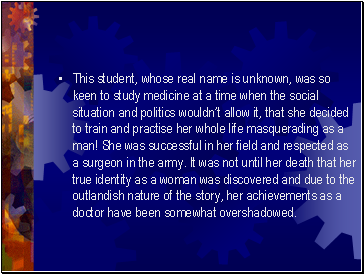 This student, whose real name is unknown, was so keen to study medicine at a time when the social situation and politics wouldn’t allow it, that she decided to train and practise her whole life masquerading as a man! She was successful in her field and respected as a surgeon in the army. 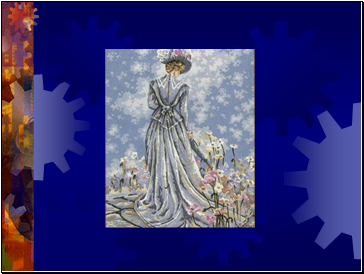 It was not until her death that her true identity as a woman was discovered and due to the outlandish nature of the story, her achievements as a doctor have been somewhat overshadowed. For thousands of years the medical professions were reserved almost exclusively for men. 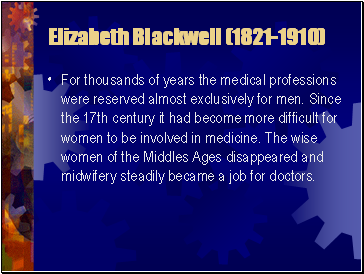 Since the 17th century it had become more difficult for women to be involved in medicine. 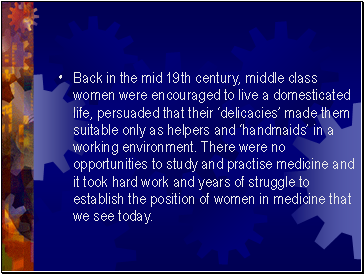 The wise women of the Middles Ages disappeared and midwifery steadily became a job for doctors. Who was Elizabeth Garrett Anderson? How did Anderson change medicine in Britain?